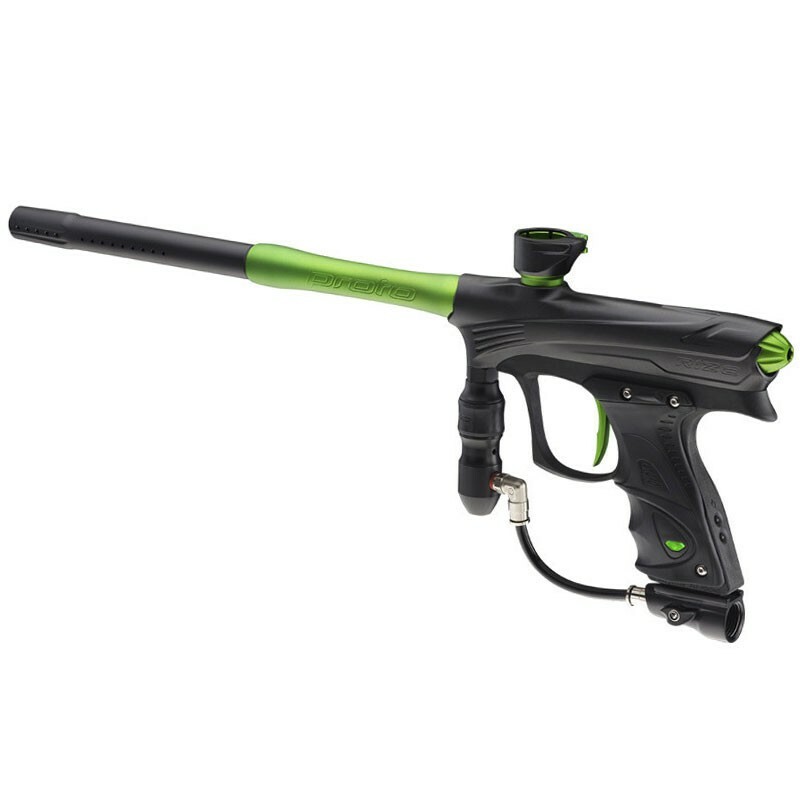 Built up from a long line of successful Proto Paintball markers the Proto Rize Maxxed is packed with updated features that otherwise are only found in ultra high end platforms. 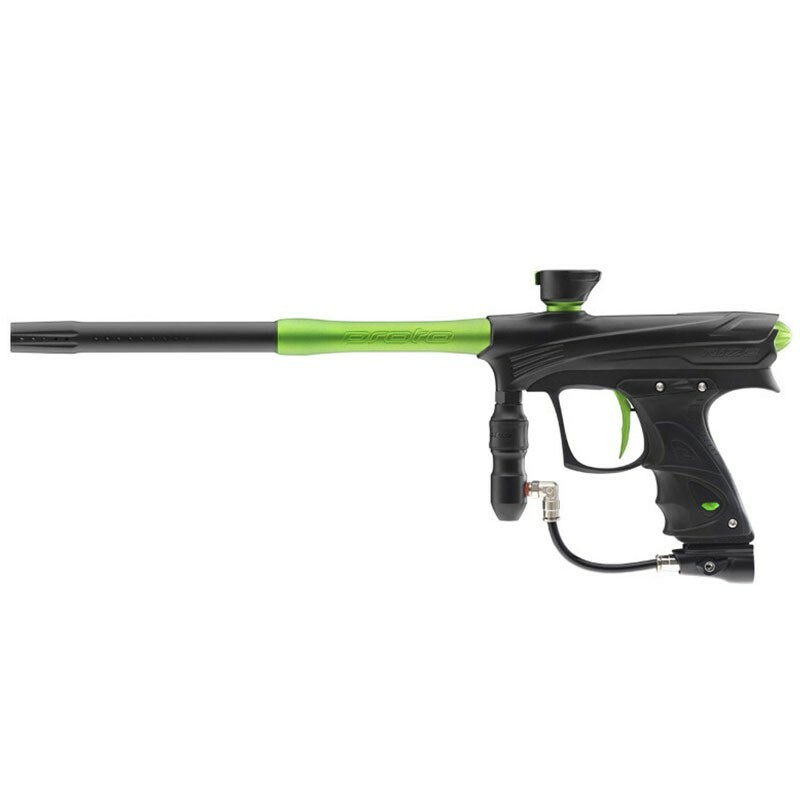 Created to perform at top levels, yet built with your budget in mind this high-powered, entry-level marker provides you with tournament level firepower for a fraction of the cost. The Rize Maxxed utilizes an anti-chop break beam eye system synchronized by an LED circuit board offering 4 tournament firing modes and adjustable rate of fire. A new Fuze bolt kit boasts 15% lower operating pressure. Operating at a low 140psi gives you better airflow and a more reliable function game after game. The proven Hyper 3 regulator has been simplified for easier maintenance while the new solenoid has improved hose barbs and seat to give the Rize better air efficiency and a 25% lower dwell setting. Macro line has replaced the steel braided hose, so you can now use standard macro line and fittings. Accuracy won't be an issue with an included True Bore Proto two-piece 14" barrel while a clamping feed neck keeps your loader locked in place during aggressive moves. Comfort is not sacrificed for performance with the Rize as a UL 45 frame, dual density sticky grips, no slip regulator sleeve, adjustable aluminum trigger, and a low profile balanced design for improved control. Keep in mind style won't be sacrificed with the contrasted color anodizing you desire. With Anti-Chop eyes, screw together bolt design, DYE’s self-cleaning M2 series eye pipe, and color-coded o-rings, cleaning and maintenance is quick and simple. Truly, the Proto Rize Maxxed was created and designed for top-level performance at a reasonable price. True Bore Two-Piece Barrel 14"
shoots on point, easy to field strip and allot of fun. bought it to play along my heavily modded Bt Delta Elite. I'm sure will be my primary as its far more accurate than the Bt , quieter and easier to maintain. the quality and features are choice and I'm loving the sound signature and accuracy. highly recommend, it kills for the price.